In recent years, platinum ring bands have skyrocketed in popularity. One reason so many people love platinum rings is their durability. However, platinum rings are also aesthetically pleasing, too. Their glossy, silvery shine makes the especially attractive when paired with diamonds. The shininess of platinum rings helps elevate the fire and brilliance of a diamond. However, platinum is also more expensive than traditional gold bands. Additionally, platinum rings are much heavier than their gold counterparts. If you are considering platinum ring bands for either an engagement ring or wedding bands, keep reading our guide to learn everything you need to know about platinum. While the majority of wedding rings and engagement rings are made from gold, platinum’s popularity continues to rise. As the most rare precious metal on earth, platinum’s market value is significantly higher than gold. Therefore, platinum bands will cost more than traditional gold rings. 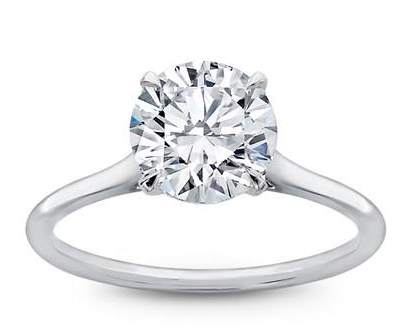 Platinum engagement rings also have an incredible amount of sparkle. The high polish of platinum rings makes diamonds look especially fiery. However, platinum bands also have an increase in durability that also justifies their price. Because of their strength, platinum bands are less likely to be damaged or have gemstones that come loose over time. Caring for a platinum ring is similar to caring for any other fine jewelry. While platinum is incredibly strong, there is still the chance that the ring may become damaged. Platinum rings should be cleaned with a simple jewelry cleaner; high grade cleaners should only be used by professionals. Like other wedding bands or engagement rings, a platinum ring should be professionally inspected and cleaned by a jeweler every six to twelve months. Additionally, when the ring is not being worn, it should be safely stored in a jewelry box, preferably one lined with a soft fabric. Finally, even though platinum is very strong, be sure to regularly inspect the prongs of your platinum ring to ensure nothing is loose. If you do have an issue with your ring, contact a jeweler as soon as is convenient. To learn more about ring metals, visit the Adiamor Metal Education page today!